The tiny creature has eight spindly legs like a spider but is part of the harvestman species - the same family as the docile daddy long legs. But pictures of the unusual critter have sparked a fierce debate on social media over whether its strange appearance is cute or creepy - and whether the top half of its body resembles a rabbit or a dog. 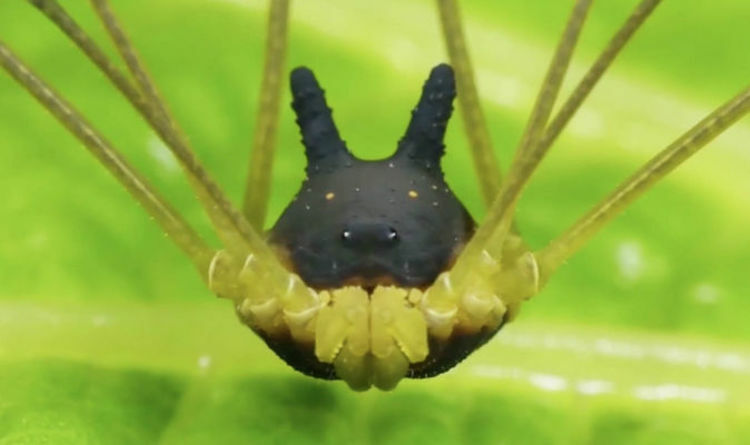 Images of the arachnid - which is commonly known as the Bunny Harvestman - have gone viral after science writer Ferris Jabr tweeted a picture originally snapped by photographer Andreas Kay in 2017. Some Twitter users say the black top of the critter’s body looks like a wolf head, with two white spots at the front making up the nostrils and the yellow spots conveniently placed to resemble glowing eyes. Others have pointed to the usual cones protruding from the rear of the body as evidence the creature looks more like a bunny. But others were less scared by the creature’s unusual appearance. Describing his find in a blog post alongside footage of the creature last year, Mr Kay said: “Watching this bizarre looking ‘Bunny Harvestman’ one cannot help but wonder if a mad scientist has grafted a rabbit's head onto an octet of spindly spider legs. Hilarious! “Surprisingly, the members of the arachnid class are not classified as spiders even though they have eight legs. The photographer also theorised about the use for the strange bumps. The strange type of harvestman was first described by German arachnid specialist Carl Friedrich Roewer in 1959.